Normal Trap Cards (Japanese: 通（つう）常（じょう）罠（トラップ）カード Tsūjō Torappu Kādo) are Spell Speed 2, and can be used in response to the effects of everything that is classified as Spell Speed 1, such as Effect Monsters, and Spell Cards, or Spell Speed 2, which include Quick Effects, most other Trap Cards, and Quick-Play Spell Cards. Trap Cards have to be Set face-down and can be activated after the turn you Set it (starting from the opponent's Draw Phase). Some Trap Cards, like "Delta Crow - Anti Reverse," have conditions in which they can be activated the turn they are set, or even directly from the hand. 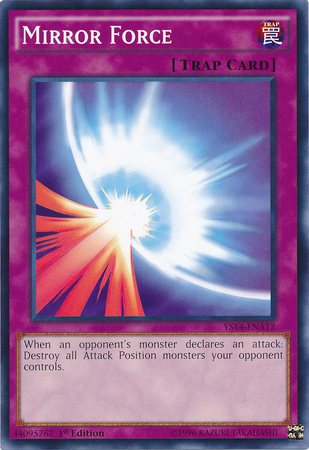 In addition, the effects of other cards, such as "Makyura the Destructor," can enable you to activate Trap Cards in such ways. Some Normal Trap Cards, like "Blast with Chain" and "Horn of the Phantom Beast" become Equip Cards after activation; in this case, they remain on the field after activation.